It’s been 40 years in the making, and we hope that we’ve managed to capture a hint of how much has changed across the Norwegian Continental Shelf since the beginning of Norway’s “oil adventure”. We kick off this issue with a little self-reflection. Our publisher, Truls Gulbrandsen, has followed in his father’s footsteps, which is only natural, considering that he grew up with the magazine. But it’s not all about us. We also have looked into the historical perspective of a number of NCS activities. Statoil also began in those early years, and since then the company has been know for a number of firsts. We include a profile of Margareth Øvrum, Executive Vice-President for Technology, Projects and Drilling – Statoil’s “Lady of Firsts”, who worked her way up from intern to offshore platform manager to her current position. Lundin Norway may not have been here since the beginning, but Managing Director Torstein Sanness is an industry veteran, who has led the company as it’s grown to be a powerhouse on the NCS. A great example of a North Sea builder. Expro is also celebrating 40 years this year (Congratulations! 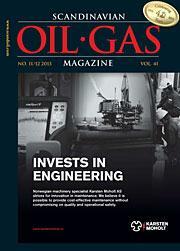 ), so we include a look at their achievements – and how their expertise has grown – which have shaped them into a leading oilfield services company. From AGR, we hear of expansion in Norway, and how they continue to develop their Stavanger hub to serve the industry. The industry has also relied heavily over the decades on supply bases along the Norwegian coast. We spoke with the leadership of NorSea Group – one of the original contributors to the magazine – about how the industry has grown and evolved for them. In addition, we spoke with Coast Center Base’s Managing Director to learn how CCB has become not only a Norwegian focal point for subsea support, but is poised to become a global nucleus for subsea infrastructure. And we also hear from Dr.techn. Olav Olsen – a pioneer engineering design firm – about the early days on the NCS, as well as a look to the future. Satellite communications have also played an important role in offshore activities, and we hear from Intelsat about how things have changed since the days of two-way radio. And no look at the development of operations on the NCS over the last 40 years would be complete without including the very first of all NCS fields – Ekofisk. ConocoPhillips’ Manager for Greater Ekofisk Operations, David Hendicott, is the focus of this issue’s profile, which includes an all-too-brief history of a field that still holds a great deal of potential. And these are only a few of this issue’s features. As always, we focused on technologies ranging from subsea valves and monitoring to topside monitoring, whether by thermal camera or unmanned “drones”. Before you know it, 2014 will be here, so be sure to look for us at upcoming conferences and events. We’ll be using the holiday season to plan for the New Year – so as you make your plans, be sure to let us know what’s been happening and what’s coming up. We can help you spread the word.